Red beetroot soup is prepared from 100% natural components without preservatives, artificial colors and flavor enhancers. A short list of components is a guarantee of greatest taste. Red beetroot soup tastes and smells like homemade, reminding the most memorable moments of childhood. 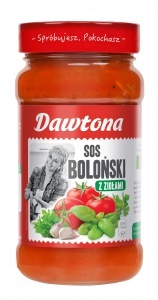 It tastes excellent cold as well as heat, it is particularly recommended for traditional polish dishes (f.e. dumplings). It takes just a few minutes to serve it – fast and healthy! Product available in 1,1 l carton. *Reference intake of an average adult (8 400 kJ / 2 000 kcal). Raw power of vegetables and unique Italian flair. 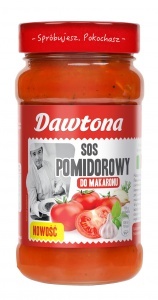 Full of big, juicy chunks of tomato and onion seasoned with carefully selected mix of aromatic herbs, Dawtona’s tomato sauce is a guarantee of intense flavor and aroma. The thick sauce serves as a base, making preparation of meals easy. Just add pasta, fresh basil leaves, a bit of grated cheese and serve as a fast and simple, yet tasty dish. Product available in 550 g jars. A feast in true Italian style is at your fingertips – all you need is a moment to enjoy the aromatic, thick, tomato sauce. The taste of sun-ripened tomatoes accompanied by an intensely herbal aroma and just a hint of garlic... Talk about a real treat for the palate! Product available in 370 g and 550 g jars. Did you know that Hungary has more than 100 varieties of peppers? Their distinctive flavors are the basis of many original Hungarian dishes. 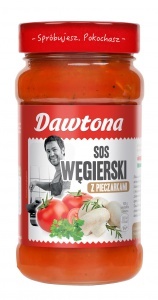 With a distinct hint of mushrooms, Dawtona’s sauce is perfect with potato pancakes, beef goulash, pasta with minced meat or... a traditional Hungarian pancake! What pasta needs the most is ripe, juicy tomatoes broken by a hint of thick cream. Flavors contained in this jar will allow you to conjure up an authentic, Italian style meal in just a few moments! 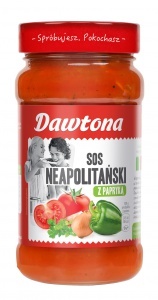 Aromatic sauce full of ripe tomatoes, accompanied by chunks of juicy, red peppers. 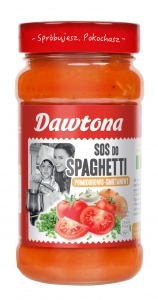 This dense, full-flavored sauce will appeal to fans of Italian dishes with southern character! Red beans coupled with crunchy corn, bathed in lush tomato sauce with a hint of pepper. Just add cooked rice and your favorite ingredients to create a delicious dish is just a few minutes. It is excellent in tortillas, quesadillas and fajitas, chicken or beef. This sauce is a favorite among the amateurs of distinctive flavors. Simple and reliable combination of flavors. 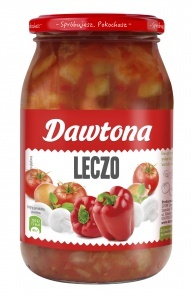 Thick tomato sauce with a hint of pepper, complemented by the lush pineapple sweetness. A treat for any lover of oriental flavors and a staple of Asian cuisine. Perfect accompaniment of rice and fried meats. Time for a Chinese feast! Juicy, ripe tomatoes, sweet pineapple and oriental bamboo shoots are the perfect start of an exquisite, Chinese style sauce. Mun mushrooms, corn and crunchy peppers enrich the sauce with even more character. Now all you need to do is cook the rice, fry the chicken or beef, and enjoy a delicious dish! Here's a ready-made dinner dish! Just pour it into the pan, heat and enjoy the delicious taste. For those who cannot imagine dinner without meat, we suggest adding diced sausage. White beans in tomato sauce also work very well also as an ingredient in casseroles, and the English like to eat it for… breakfast! Product available in 400 g cans. Enjoy a traditional Hungarian dish in just a few moments! Thick, creamy sauce full of peppers, mushrooms and onions seasoned with aromatic spices - it's an excellent idea for a quick and nutritious dinner. Lecso is great as a single dish served with crusty bread, as well as with meat. Product available in 950 g jars.